Volvo's racing group got a name change: "Cyan Racing". The fast Volvos you see on the street and at dealers are still "Polestar" models. Volvo’s racing group got a name change today. Cyan Racing is the new name. Polestar Racing is out, but note the name of Volvo’s high performance street model line is unchanged… the fast Volvos you see on the street and at dealers are still “Polestar” models. Ever since Volvo acquired Polestar, we knew changes were coming to the performance company’s racing division. 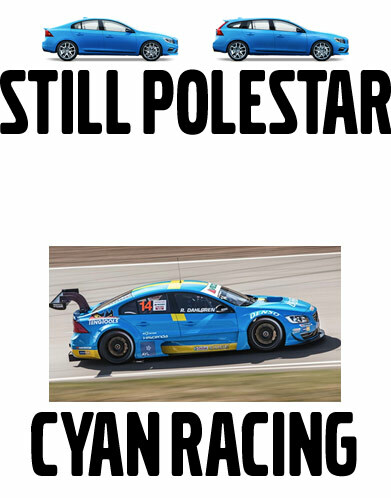 Although not a part of Volvo’s purchase, and still independently owned by Christian Dahl, Polestar Racing will now be known as Cyan Racing. The new name represents the Cyan blue color seen throughout the Polestar lineup. Cyan Racing will make its next showing at the penultimate round of the 2015 Scandinavian Touring Car Championship in Stockholm, Sweden, beginning September 11. Since 1996, the team formerly known as Polestar Racing has been tasked with directing Volvo’s motorsport program, participating in the STCC, WTCC, and V8 Supercars Championship races. Over the years, it has claimed 14 titles, over 100 race victories, and more than 220 podium finishes.